It’s official: We’re in a bull market in cannabis. As regulations open up, we are entering a period where the value of the many different components of the supply chain is still being figured out. The stock market is where stories go to become monetized, and it didn’t waste any time with this new business strain. Anything with pot in the name took off for a run in 2014, when Health Canada started giving out licenses for production and sale for medical purposes to a select few, and as the states of Colorado and Washington legalized it for recreational purposes. The mania wore off for much of 2015 as legislators dawdled, before it got going again in 2016 ahead of a US election that featured legalization propositions in many states. 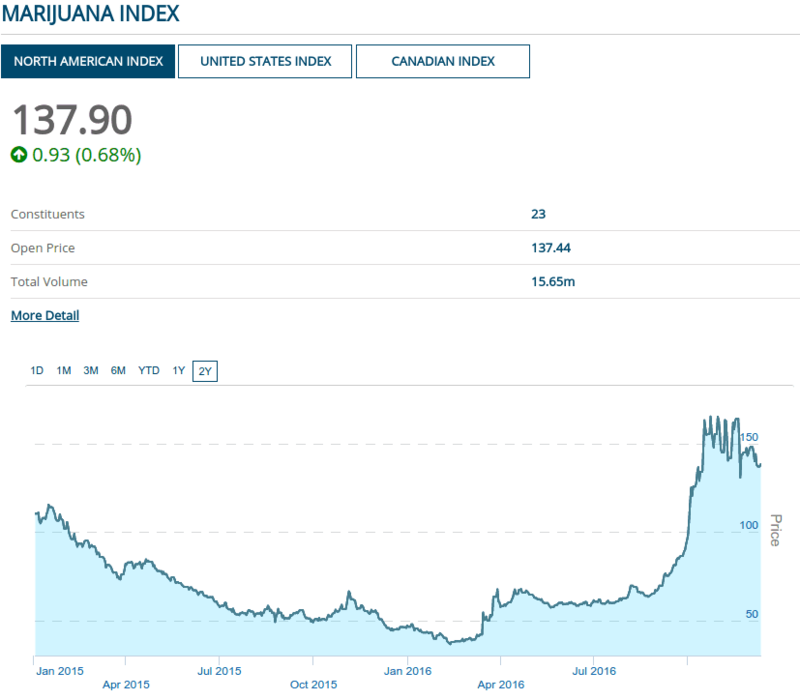 The Marijuana index took off again in a big way after that election, and is currently oscillating, trying to decide if it wants to plateau, come back to earth, or go on another run. We see this kind of thing often in resource markets. Steel makers worry publicly about a shortage of manganese or molybdenum or whatever, and every company that can reasonably lay claim to any is suddenly using it to lead their pitch and has gained 20% in the last week. But the marijuana business hasn’t been around long enough for us to draw a direct parallel. This is a brand new business with a demand profile that has been sustained on informal markets for many years. The various angles and verticals of the legal pot business are still being figured out. More de-regulation and increased value seems to be the odds-on bet going forward, but where most of that value will materialize is anyone’s guess. Equity Guru asked me to take a look at Invictus MD Strategies, a fairly recent entrant into the marijuana business with a unique approach and a compelling profile. Assuming that public sentiment continues to move in the right direction and regulations follow, Invictus stands to be caught up in a rising tide with its peers. The difference could well be this shark’s ability to swim. Today’s marijuana companies are effectively a live test of strategies, technologies and business models in various different markets and various different jurisdictions. That’s very exciting from a business perspective, because it’s the only way to really determine what works. Right now, the only thing that’s for sure is the demand. There is a rich history of great companies being built in high-demand markets. Ian Telfer’s stewardship of Goldcorp comes to mind. Telfer became CEO of Goldcorp in 2004 after a merger with Wheaton River. Gold traded for around $400/oz at the time. He started buying mines with reserves and lowish production cost, sometimes over-paying, just to make sure. As the gold priced traveled to $500/oz, to $700/oz, then to $1000/oz in 2010, Telfer’s early spending spree looked like a bargain run. Goldcorp was sitting on reserves that cost the company $250/oz, with operations on top of them, fully optimized. But marijuana isn’t a mineral. There’s enough variation in the product that it doesn’t lend itself to agricultural exchanges like soy beans or wheat. Besides, Invictus MD isn’t set up to give investors exposure to the price of pot – at least not directly and not at the moment. Perhaps services businesses make a better analogy. Richard Kinder and William Morgan built midstream pipeline giant Kinder Morgan, beginning in 1999, by purchasing various small and then large pipeline networks. They started with the pipeline network that Enron spun out (ostensibly to focus on energy trading supported by fraudulent accounting), and added to it opportunistically until they wound up with an enormous network of lines and terminals worth more than the sum of its parts. Today, Kinder Morgan handles about 40% of US oil and gas transmission. The company made the best of a couple of oil and gas booms, but oil price appreciation didn’t have anything to do with it directly; midstream operations collect tolls based on volume. KM took advantage of more petrol products being needed in a growing economy, and the increased volume from new wells that were being created in previously uneconomic reserves. As it became apparent the price of crude was headed to a level that made bitumen operation economical, KM bought BC Gas (name since changed to Terrassen Gas, and since taken over by Fortis), the owners of the Trans Mountian pipeline, and the quickest way to get that bitumen to China, where the Alberta producers are itching to send it. KM spun off the gas distribution assets, but kept the Trans Mountain. The oil industry had been around for 100+ years before Richard Kinder got a hold of it. Legal weed is brand new, so Dan Kriznic may be more like Norman Rockafeller than Richard Kinder… but let’s not get carried away. Burgeoning spaces and growing markets hold incredible potential, because they carry such great risk. The gold price could have fallen apart on Ian Telfer. Kinder Morgan could have been put out of business by falling line tolls or an oil crash. The weed price or the ability to traffic in it in meaningful volume could vanish on Invictus CEO Dan Kriznic and the rest of the pot industry as quickly as it showed up. Invictus MD Strategies is primarily a bet on the continued expansion of recreational and medical cannabis, but it’s specifically a bet on Dan Kriznic’s ability to understand the composition of and trends in the industry well enough to trade in the businesses that form its components. For those inclined to make such a bet, this company gets fun and interesting in a hurry. Right now, Invictus has some difficulty articulating what it actually does. This is to be expected from an outfit who is doing something that has never been done before. The company is called “Invictus MD Strategies Corp.,” ostensibly because strategies are its stock in trade. The “business strategies” portion of its web page is a buzzword-heavy missive that lays out a basic plan to invest in businesses that it feels are undervalued, and to foster their growth. From that angle it looks like an incubator, but there’s more than that going on here. The marijuana business is a funny mix of known technology and processes that are used to create an agricultural product that the public is very familiar with and loves, while governments carefully loosen up regulations in such a way that they can carefully determine how to best tax it. As the process plays out and working verticals emerge, there is bound to be great value fluctuations in the companies who provide the associated hardware, software, services and the product itself. Invictus is built around the idea that the company can trade that climbing market. Kriznic has designed a company to be able to buy and sell the pieces of the marijuana machine as it’s being assembled, taking profit on certain modules as the opportunity arises and keeping the ones that are complimentary or too cash intensive to let go. The company has already bought and sold SunBlaster (a company that made lightbulbs for indoor growing) and is in the process of adding to their 82.5% interest in Future Harvest, a company that produces fertilizer products used in the cannabis production process. There are plans to spin Future Harvest out into a NewCo, but it stands to reason that that plan is fluid. Invictus doesn’t lack for activity. At the time of their last financial filing (July 31st, 2016), the company listed holdings in Poda technologies (a vaping outfit), Vitaleaf management, (a patient management company), and the aforementioned Future Harvest fertilizer business. Since the publishing of those financial statements, the company has grown the revenue in Future harvest by 50%, and announced a $0.07 dividend to shareholders. Next, they went shopping. The company cut an all-stock deal for an interest in a testing laboratory (contingent upon the laboratory receiving Health Canada certification), cut another all-stock deal for a 10% stake in a Nevada cultivation license (with an option to buy an additional 50% interest), and made yet another deal to purchase a one third interest in AB Labs, a Health Canada certified production facility (cash and stock). Invictus then announced a $10M private placement to fund that transaction, oversubscribed that private placement to raise $12M, made another deal for a 20% stake in a new cultivation facility in Washington St. (also contingent on licensing), and added UBC research professor Dr. Paul Shipley to its consulting staff at Future Harvest. Then they went out and got commercial horticulturist Phillip Hague to oversee their US production. This flurry of activity front-ran marijuana ballot initiatives in the United States, and continued at pace after the election. It’s an impressive run of activity that gives the company exposure to a diversity of business verticals in the marijuana space for what could one day be seen as a tremendous bargain. What stands out to us about this series of moves is the care with which the company treats its equity. Stock is easy to print. So easy that the temptation is to bleed paper to get the assets that one wants, reasoning that their appreciation will make up for the dilution. Many a company has done just that at low stock prices, and created a paper albatross that they never end up shaking. Kriznic was careful to pay the dividend before cutting paper deals, showing the asset vendors an opportunity to take part in a yield-bearing security worth holding, rather than a hot potato that they’ll need to get rid of to get paid. A liquid position in a company diversified across different facets of the industry was likely an appealing proposition to owners of marijuana industry component businesses. It’s pre-packaged, intra-industry diversification. The private placement, once fully diluted and assuming all warrants are exercised, will add 24 million shares of IHM to a total float that’s currently just over 9 million shares, and raise a total of $33M. A tripling of the outstanding shares sounds jarring, but it makes perfect sense in the context of the assets that the company has acquired and the nature of the current marijuana market. Importantly, Invictus didn’t raise this money all in the same place. Their report of distribution lists 104 unique investors taking part in the offering. Spreading a private placement around like that usually makes for a healthier market. It encourages story pollination through different networks, and limits the large positions that can hurt a market all at once. It ensures that a suitor interested in a takeover has to work (and pay) for a control position. When the dust settles, we’ll be looking at a company with about 40 million shares outstanding, diversified interests in Canadian and US distribution markets, a vaping product, a fertilizer company, royalties in disposed-of assets that no longer incur any cost, various other bits and pieces that may come in handy, and about $0.34 in cash flow (assuming FH produces $500,000 / quarter in revenue and Invictus maintains their 82.5% stake). After politely pointing out that many of today’s marijuana stories are effectively “marking to market biological assets,” and making it clear that that isn’t what Invictus is up to, Dan Kriznic told Equity Guru that his “goal has always been cash flow.” Kriznic is a Chartered Accountant and Deloitte & Touche alumni, and cashflow is to a guy like Kriznic what fuel is to a Formula One team. They’re equipped to use it to create performance well beyond the industry standard. There are countless ways to effectively leverage cash flow, and a Deloitte guy will know all of them and have probably invented a few. FULL DISCLOSURE: Invictus MD Strategies is an Equity.Guru marketing client. The author has been paid to produce this report by Equity.Guru, and specifically asked to be hard but fair, despite Invictus’ client status, to help shine light on a complex story.